As the late, great R&B superstar Aaliyah once sang, "If at first you don't succeed, dust yourself off and try again". The smash single "Try Again" was released in early 2000, coincidentally, just one year after Mark Few's rise to "mid-major" glory began with the first of what is now 19 straight NCAA tournament appearances (and still counting). That song embodies the last two decades of Gonzaga basketball, as the Zags routinely fell short of reaching college basketball's biggest stage despite knocking on the door so many times. But last March, after routing Xavier by 24 in the West Regional Final, Few and his underdog-turned-powerhouse program were finally one of the last four teams standing. It was perhaps only fitting that the only obstacle that ultimately separated the Zags and college basketball infamy was one of the nation's premier blue-chip blue blood programs: North Carolina. Unfortunately, the Tar Heels were one of only a few teams in the country equipped to handle Gonzaga's massive size up-front, headlined by the Polish Hammer, Przemek Karnowski, and the 10th overall pick in this year's NBA draft, Zach Collins. Against the combined length and girth of Isaiah Hicks, Kennedy Meeks and Tony Bradley, "the Hammer" resembled more of a "miniature pickaxe" - Karnowski just couldn't get his patented baby left hook to fall as he finished 1/8 from the floor. To tip the scales even more against Few's bunch, floor general Nigel Williams-Goss was noticeably hobbled by an aggravated ankle injury, which reduced him to a shell of himself late in the game. So despite a suboptimal matchup, an untimely injury and countless attempts by the refs to hijack the game (a total of 44 fouls were called over the course of 40 minutes), hopefully by now the Gonzaga faithful have swallowed the hockey puck-sized pill of pain that was their heartbreaking defeat to North Carolina in the national title game last March. 1) Point guard play: With NGW running the show for most of last season, Josh Perkins saw his role from the prior year shift from primary ball-handler to wing shooter. Given some of Perkins' ball security and decision-making issues in prior year, this wound up being a much better fit for the Bulldogs. Perkins seemed to mold perfectly as more of a spot-up shooting specialist and proceeded to knock down a team best 40% of 158 attempts from the land of plenty. With NWG departing, the question now is will Few move Perkins back to a lead guard spot in hopes that he can efficiently run the offense and cut back on turnovers? Or will he keep Perkins off-the-ball and go in a different direction at the 1? The good news for Few is that he has a few reliable options who should be capable of running the point if Perkins falls back into old habits. Fresh off an LDS mission in Lyon, France, Jesse Wade - a top-125 overall recruit in the class of 2015 - is a name diehard Gonzaga fans have likely heard whispers about for a few years now. Recruiting analysis from 2015 projected Wade as a scoring point guard and lights out shooter, but noted clear signs of his development as a facilitator - precisely what the Zags need this year. I'd bet comparisons to Kevin Pangos and Derek Raivio, whether justified or not, will emerge this season as more and more eyes get a chance to see Wade play. If he can deliver on-the-court, Ayayi may turn out to be a seamless fit at the point playing alongside two proven scoring and shooting weapons in Perkins and Silas Melson. 2) Immediate production from freshmen/sophomore class: Along with the aforementioned Wade and Ayayi, Few will need his other young guns to make an immediate impact at multiple positions. While Zach Collins clearly shined the brightest of the five prospects in Few's 2016 recruiting class, Killian Tillie's per minute stats indicated he was one the Zags most efficient offensive options last year. He will need to bulk up significantly if he's to be relied upon as a consistent low-post defender and rebounder, but his offensive skill and versatility already has NBA scouts salivating. Just refer to some way-too-early mock drafts that slate Tillie as a borderline lottery pick. Another promising young asset is Zach Norvell, who hails from Chicago's Simeon High School (Derrick Rose and Jabari Parker are notable graduates). Norvell redshirted last season behind a deep, talented and experienced backcourt, but should now get a chance to shine in his first year of eligibility after redshirting last season. An ex top-100 recruit per ESPN.com, Norvell is a smooth, left-handed scoring 2-guard, who should provide some much needed perimeter depth behind Nelson and Perkins. In the front court, recent reports from the U19 circuit this offseason have highlighted that rising sophomore Rui Hachimura has been a double-double machine for the Japanese national team. Him and incoming frosh Corey Kispert are a pair of versatile hybrid wing/forwards that will be nightmare matchups for opposing WCC defenders. Jacob Larsen - another foreign big from the land of Denmark - is just another potential X-factor that is oozing with talent. Larsen is arguably the most physical of the Gonzaga forwards and could very well blossom into Few's best interior defender. As this article points out, a series of unfortunate and tragic events over the past two years of his life have simply stunted his growth as a player. How quickly the Zags can turn the page from last season's chapter lies in the hands of a few unknown, but highly capable underclassmen. One reason to be bullish on their trajectory is guys like Hachimura and Norvell were essentially given an inside access pass to the run of last year's NCAA title runner-up team. In other words, they got to watch and learn first hand what it takes to win consistently over the course of a long season with a perpetual target on your back. These lessons should be invaluable as their individual expectations will rise quickly this season, along with the talented freshman class coming in right behind them. Bottom Line: What made Gonzaga so good last year was their elite defense (ranked #1 nationally in adjusted efficiency, per kenpom.com), which was grounded in solid, contain-focused defending that rarely, if ever, surrendered an uncontested look. 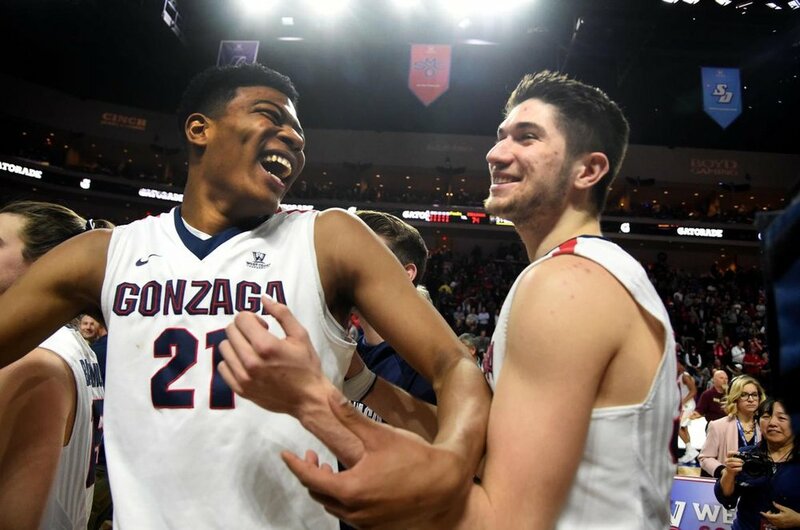 The underclassmen will need to replicate the commitment to get stops that their former upper-classmates exhibited last season if the Zags want to compete for a top-4 seed in the dance. The veteran returning core of Perkins, Melson and Johnathan Williams III make Gonzaga immune to any significant regression, but the production coming from the freshmen and sophomores - many of whom are unknown to the casual college hoops fan - will dictate the destiny for this year's team.